suite of tests defined in the USB-IF specifications for OTG 2.0, and Battery Charging. The PET tester hardware was designed in co-operation with the USB-IF USB On-The-Go Work Group, and the Battery Charging Work Group. The PET is used by compliance test houses, and has also been found to be of great value to developers of OTG Devices, Embedded Hosts and other Portable Devices, as it can save its cost many times over in potential failure of compliance testing done for the purpose of certification. The PET is delivered complete with MQP's Windows application GraphicUSB for generating the test reports, and also analyser-style captures. The USB-PET provides automated compliance testing of both the data protocol and the electrical and timing requirements of the 'USB On-The-Go and Embedded Host Automated Compliance Plan for the On-The-Go & Embedded Host Supplement Revision 2.0'. The suite of test scripts provided was developed in co-operation with the USB-IF USB On-The-Go Work Group, and is now at official release level. All aspects of On-The-Go, Embedded Hosts and Peripheral Only Devices are tested, including VBUS voltage and current performance, and SRP, HNP and ADP protocols..
Additionally the USB-PET can carry out the compliance testing required by the 'USB Battery Charging 1.2 Compliance Plan', including tests on Charging Ports, Portable Devices, and Accessory Charger Adapters. The suite of test scripts provided was developed in co-operation with the USB-IF Battery Charging Work Group, and is planned to reach official release level in October. As well as compliance testing, the Packet-Master USB-PET has the valuable capability of being able to capture an analysis of the activity on the bus during the compliance test, in the same format as produced by our range of analysers. This allows rapid investigation of protocol-based test failures. Usually tests are carried out as a suite for a particular type of Unit-Under-Test (UUT). However it is simple to select individual tests from the suite, in order to investigate the cause of a failure. Additionally, because the tester is script-driven, users can write their own test scripts as a part of a more in-depth investigation, for example changing parameters from the standard tests, in order to determine behaviour of a UUT. Single click operations allow the initiation of any of the High Speed Electrical Test modes defined in the supplement and the core USB specification. MQP can supply a range of optional Test Fixtures to assist with electrical measurements. 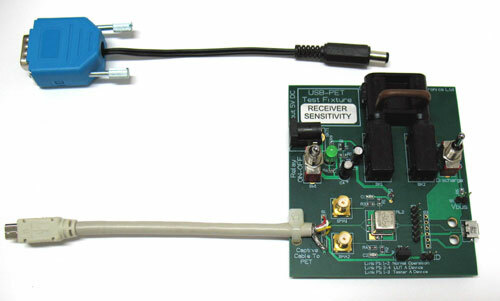 Special fixtures are required because of the unique test cable arrangement with its extra ID pin controlling signal. Each of these test fixtures includes provision for the Inrush Test.